Korcula is one of my favourite Dalmatian Islands in Croatia. I don’t want to say I was surprised by how much I loved Korcula, but it certainly left a mark. 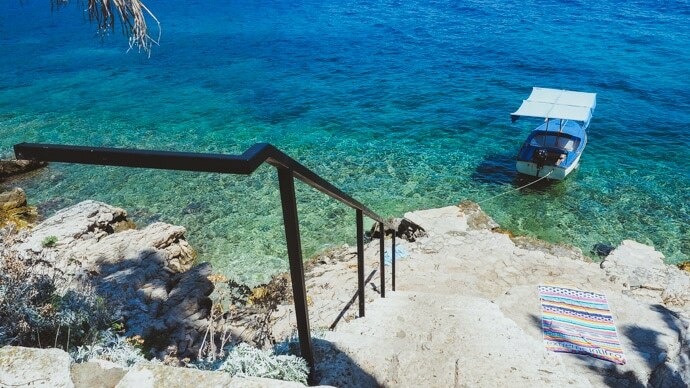 Korcula is beautiful, full of history and the colour of the water is so blue you can’t help but jump in. 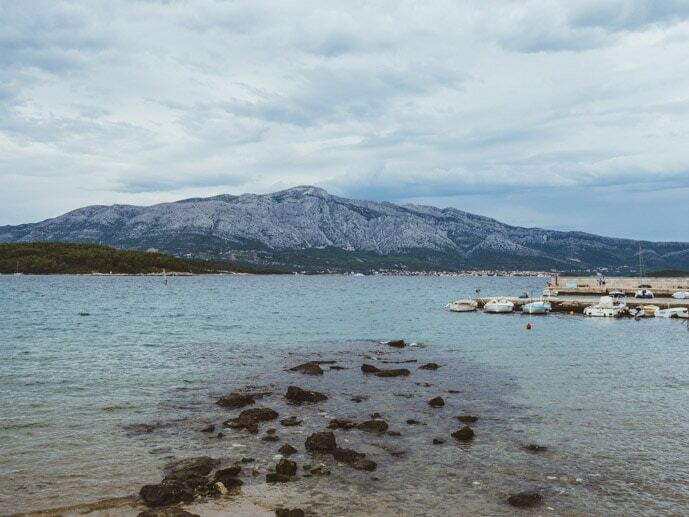 After spending a week in Korcula, here’s our guide to Korcula so you can enjoy the best of Korcula + printable guide to Korcula at the end of this post. There are so many incredible things to do in Korcula. 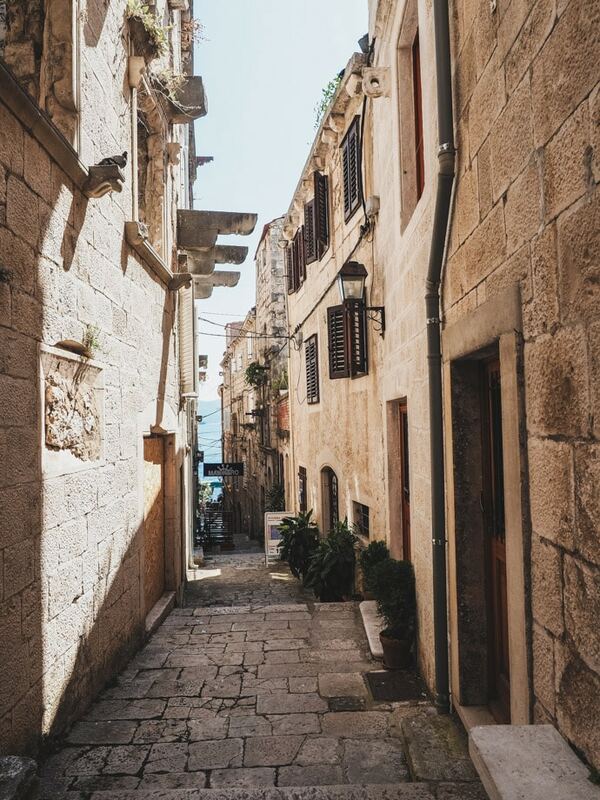 We love exploring the little streets of beautiful Korcula Old Town. Surrounded almost entirely by water, the views and architecture are amazing. Here you can eat at one of the many delicious restaurants in Korcula, explore Marco Polo’s supposed home, and take a look at St. Marks Cathedral. 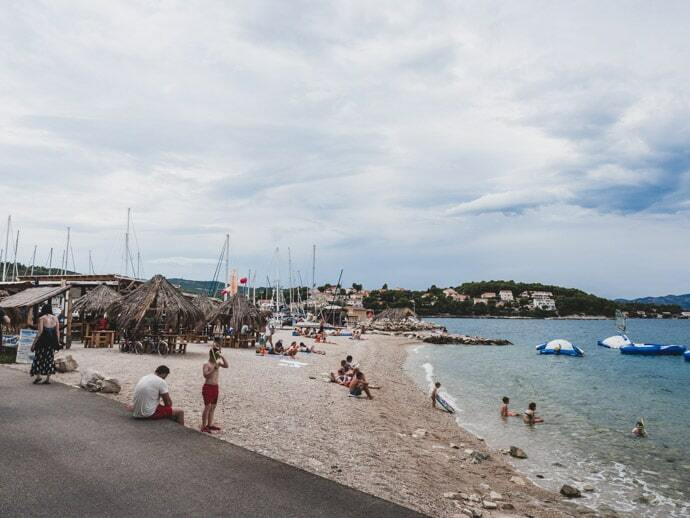 If you’re looking for a place to swim near Korcula Old Town, we loved the little beach on Put Svetog Nikole, Ispod Duvana Beach. 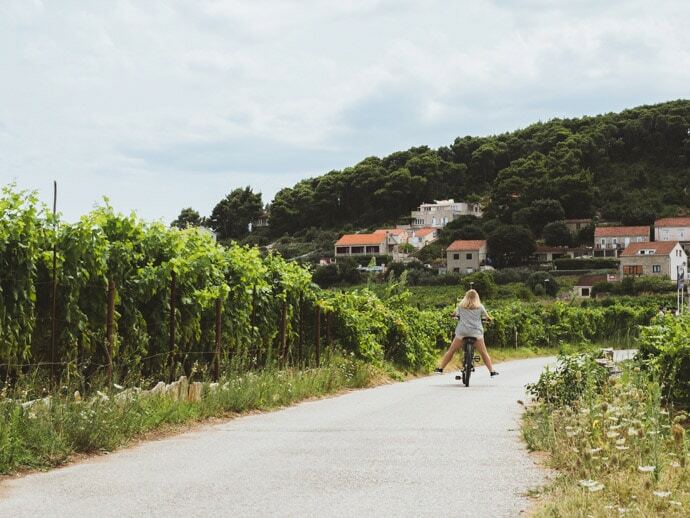 One of our favourite things to do in Korcula was to hire bicycles and ride to Lumbarda. 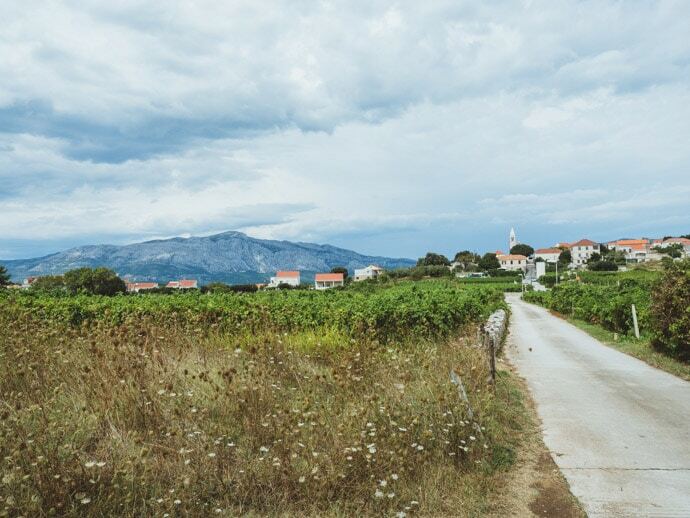 Here you will ride through vineyards and to Prvi žal beach and Vela Przina Beach. The ride itself isn’t too difficult, I would estimate it takes about 30 minutes each way without stopping. 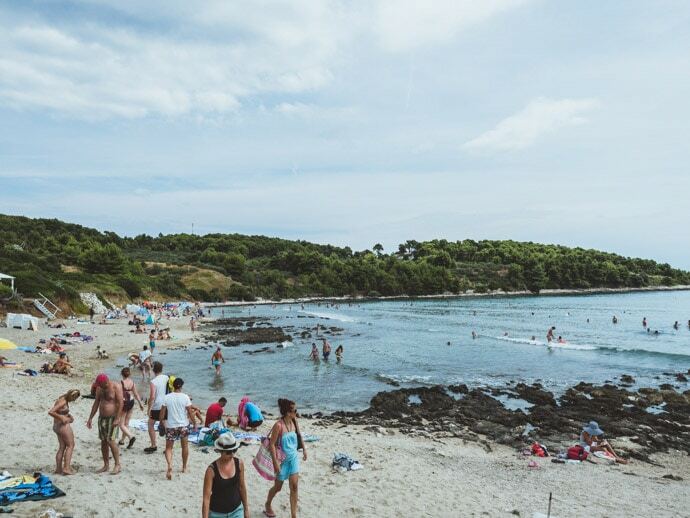 Croatia beaches are known for having sea urchins so just make sure to bring or buy some reef shoes with you. If you’re looking for a day trip from Korcula, taking a taxi boat out to Badija Island is such a great way to spend the day. This island is great to walk around, swim in the clear blue water, relax, and if you’re lucky, you might even see some of the beautiful deer that call this island home. There are also lots of little villages and areas to visit on Korcula Island too. There are so many options for where to eat in Korcula from Cafes to Konobas. We loved Kolenda for breakfast near Korcula Old Town. For dinner, both Nonno and Restaurant Filippi in Korcula Old Town are excellent, serving Dalmatian cuisine overlooking the water. 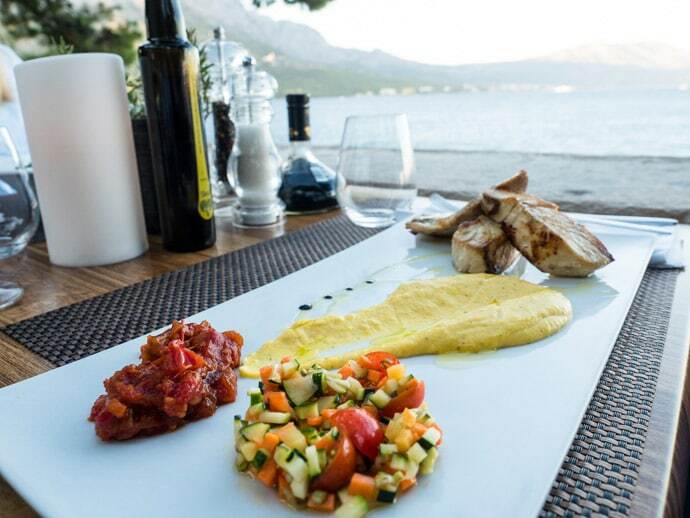 See all of our favourite places to eat in Korcula here. Wine Bar Bokar is also a nice place to try the local wines, Grk and Posip. Lesic Dimitri Palace – 5 Star luxury hotel in a stunning location in Korcula Old Town. Tara’s Lodge Hotel – beautiful modern accommodation in a peaceful location. Hotel Fabris – located in Korcula Town in a traditional stone building. The best way to get to Korcula is by ferry. We took the Jadrolinja ferry from Dubrovnik, Croatia. There are no flights to Korcula Croatia but the nearest Airport is in Dubrovnik. 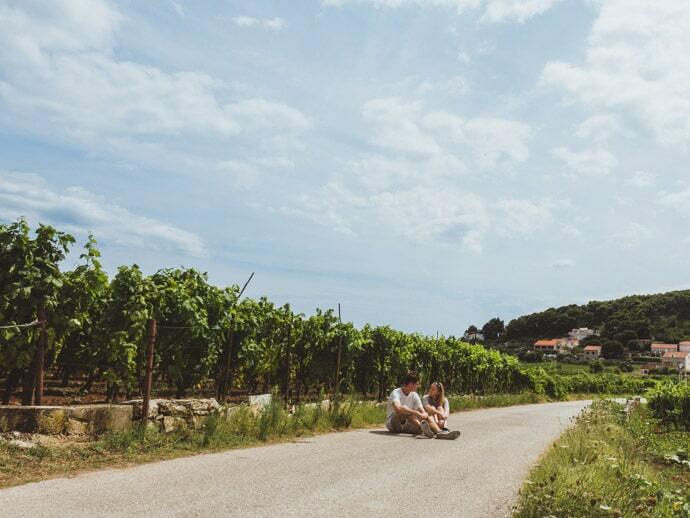 From Dubrovnik, you can get the ferry, or drive + car ferry or take a bus. If possible, I would book your ferry tickets in advance online. You can get around Korcula Old Town by walking, which is great if you are based here. You can also cycle around parts of the island. There are public buses, you can hire a car, or get a taxi. There are also some taxi boats to neighbouring islands and you can hire a boat. 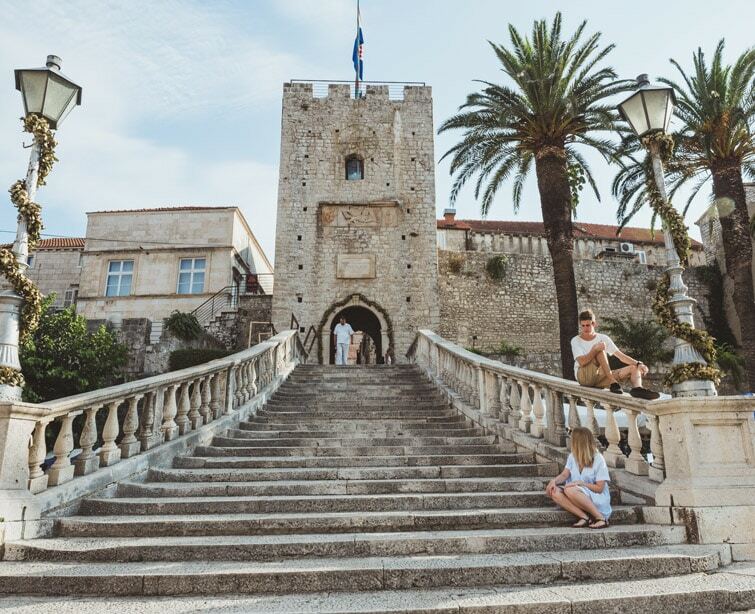 If you want to minimise the need for too much transport, then base yourself in Korcula Old Town, as there are plenty of things to do and places to eat here. We visited Korcula in August, the weather was beautiful and perfect for swimming. If you want to visit Korcula with swimming in mind, then the peak months from June to September would the best. 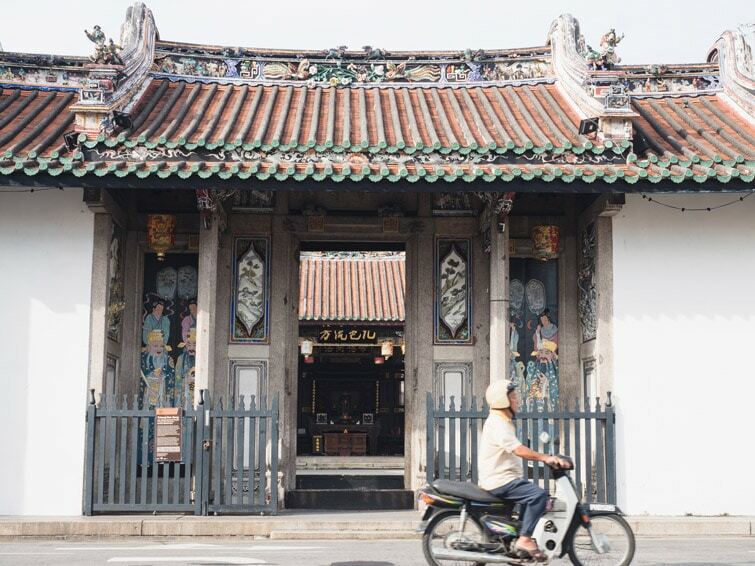 If you’re happy to enjoy the natural surrounds, want cooler weather for activities like bike riding, then April, May and October would be good, keeping in mind, fewer restaurants may be open and there may be less transport to the island. 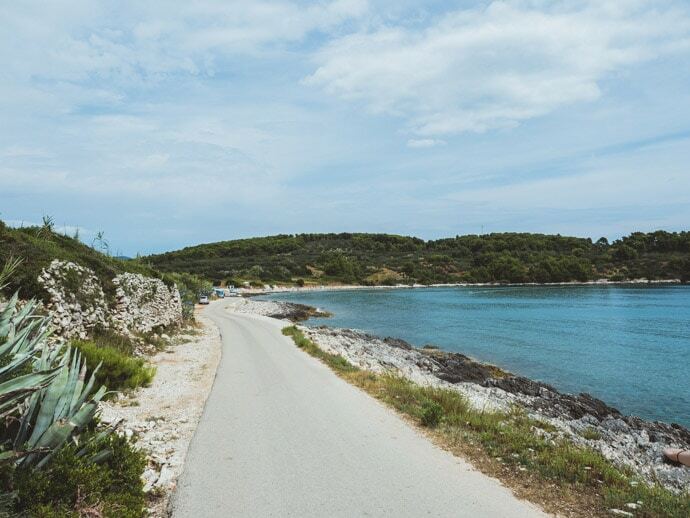 If you want to explore further, there are some beautiful small islands near Korcula. We visited Badija Island, and there is also Stupe Island and Vrnik. Near Vela Luka is Proizd Island, or you can visit another beautiful Croatian Island, Mljet Island. As Korcula Island is quite big, there are plenty of places to visit on the Island too. 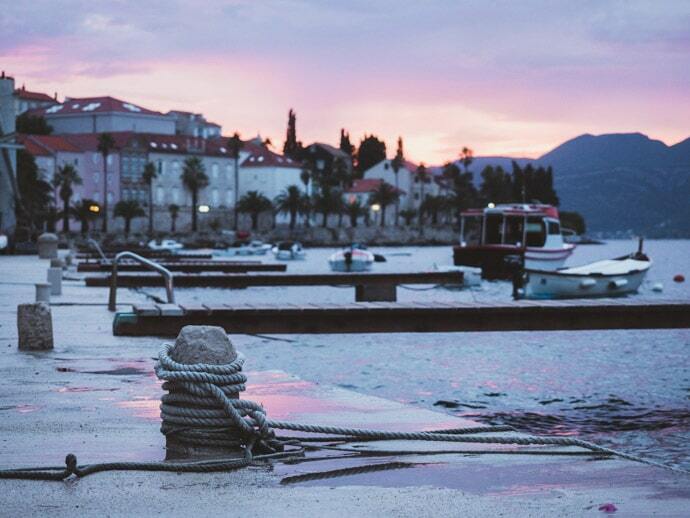 How many days should you stay on Korcula? 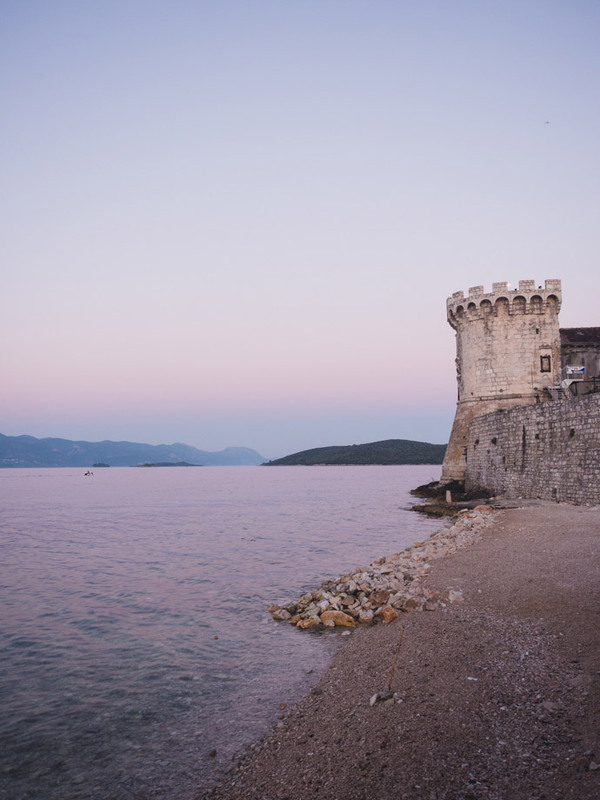 We stayed in Korcula for one week, as we wanted to explore and relax. This was a nice length of time. As a minimum, I would recommend one night and one full day, but I think two to four nights would be best to get a better feel for Korcula. One week is great if you want to take it slowly or explore a lot more. If you’re visiting in peak season, definitely book your accommodation and ferry tickets online, the earlier the better. 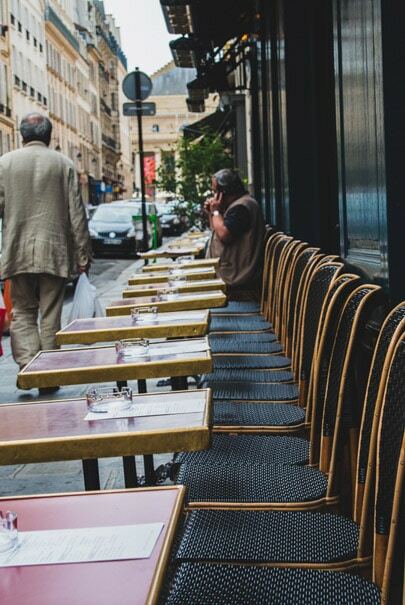 If you’re having difficulty with finding accommodation, try Airbnb as there are quite a few good options. For a first time trip to Korcula, Korcula Old Town is a great base. For more information visit the Korcula tourism board + Croatia Tourism Board. 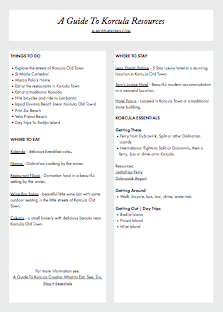 Get your free printable guide to Korcula resources here.